It’s here – the video for “The Voodoo House”! If I had to pick my favorite song of “The Snake King,” “The Voodoo House” would be it so I’m happy to hear he’s been playing it live and that he made a video for the song. Playing a shiny National guitar, Springfield seems to glide through a sunny, Spanish moss-draped swampscape, when he’s not cavorting with a mysterious seductress in a smoky nightclub … or is it all just an absinthe-fueled fantasy? Either way, we in Louisiana welcome the Australian-born star to our milieu. The “swampscape” is breathtakingly beautiful and he’s got that cool rock star look, as do the band members. So fun to watch. I almost didn’t recognize Siggy (the bassist) in that cleric getup. I wonder what the story behind that is. He’s also the author of two books; the aforementioned autobiography and a fiction novel called “Magnificent Vibration.” He’s editing a new one hopefully to be released this year, he wrote. Hey ya! Hey ya! Oh! As promised, I found some videos from the cruise on YouTube and am posting them here for your weekend viewing pleasure. Thank you to those who posted! This one reminded me that I was at the show where he first introduced Taylor Swift’s “Shake it Off” to the set list. (I’m pretty sure it was the first time because I remember being surprised about it and it seemed others were, too.) The article also mentions again that he wrote “The Snake King” in four or five days and he’s currently working on the sequel to “Magnificent Vibration.” He answers several questions from fans. Anyway, there are a lot of interesting details in this article. He is also on the cover of the Melodic Rock Fanzine. 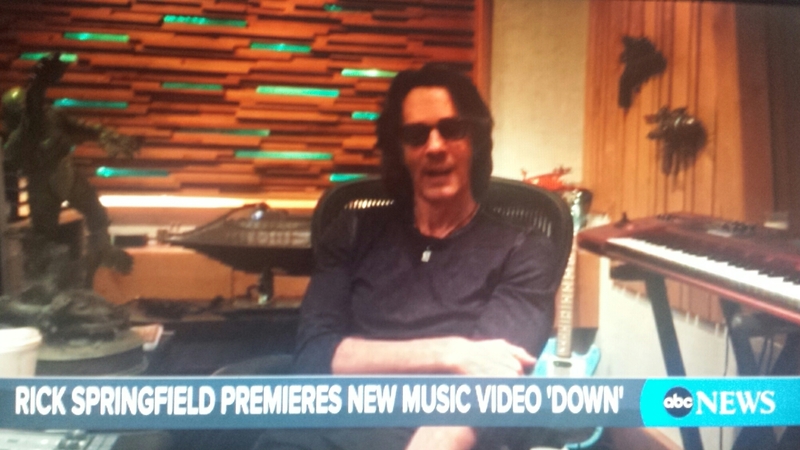 Rick Springfield takes blues detour on new album: We’ve come a long way from those preview articles from four years ago that would say things like “80s icon ‘Jessie’s Girl’ soap star singer to play in town next week.” Thank goodness. This article touches upon many of RS’s accomplishments and contains some real substance like about RS’s writing process and details about the new songs. This review of “The Snake King” is on an online magazine for hard rock and heavy metal. Do you hear that, Rock and Roll Hall of Fame judges? RS has fans from so many generations and in so many genres. Let’s plan for 2019, OK? ‘The Snake King’ slithers through your speakers like a honky-tonk cocktail consisting of good time boogie-woogie, with a heavy splash of heavenly blues ….. keep rocking n rolling buddy, we are right with ya! I just wanted to take a quick moment to thank the Rick Springfield and Us fan-based website for all things Rick Springfield for adding a link to this blog on the site. It is truly an honor to have a mention there on the comprehensive site of all things Rick Springfield. (Seriously, there is so much about RS on that site, it is so awesome. His music library, lyrics, tour dates, TV and film roles, bio of his life, books, video footage, lots and lots of pictures and so much more.) I wonder if RS used the site as a reference when he wrote his autobiography? I suppose I should also mention the official RS page, too: rickspringfield.com, which has a list of all the upcoming full-band shows, Stripped Down acoustic shows and symphony shows (coming up in Portland and Nashville), as well as next month’s ’80s cruise. Hey ya, hey ya, ooh. My youngest son was home from school today and he entertained himself at my office and on the way home with my phone, taking lots of pictures and making videos. This is what I discovered when I got home. OK, maybe the the headline of this post is misleading, but it is accurate. Anyway, I thought it was cute and hopefully we’ll see the official video soon. I was so excited that there will be a new video soon and realized that I don’t know anybody in my real life that really understands how excited I am about this (or who wants to hear about it) so I had to come back here to write about it. A new video – whoo-hoo! MTV was such a big part of my teenage years. Although we never had cable, I did A LOT of babysitting for families who did have cable and as soon as the kids were asleep, I switched on MTV. So now instead of waiting for a babysitting gig then waiting for the kids to go to sleep so I could wait for a Rick Springfield video, now I’ll just watch the Internet for a sign of the new video. Sort of like the ’80s, except now I’m 30 years older. That’s OK though, right? Anyway, when I first saw the photo of RS on the mountain, I thought it must be for “Down” because the song mentions a mountain and a river. Except the video was being filmed at an ocean, so maybe not? Then I thought maybe it could be for “The Best Damn Thing” because of the “crying on the beach” line. But that was by a raging sea. What’s the difference between an ocean and a sea anyway? “Crowded Solitude” mentions an ocean, but it seems like “Down” would be the next single since “Rocket Science” was always promoted with “Light This Party Up” and “Down” and there’s already a video for “Light This Party Up.” Yes, all of this actually crossed my mind and I couldn’t even discuss it with anyone! Did I mention how excited I am about this? I just came across this – it’s my new favorite RS video ever (on a separate level than the musical ones). This video is so fun to watch, thanks for sharing, RS! A few months ago, I wrote a song to summarize “My Rick Springfield Crush Revival” and this past weekend, I decided to try to make a video out of it. So I recorded it (on a tape recorder at home) and experimented with the Movie Maker program that came with my computer. Disclaimer: I have no illusions about being a great singer or guitarist but I did have fun making it! The video – and this blog – is dedicated to my teenage self who would have enjoyed doing these types of things if the technology had existed at the time.